There are a lot of things that I don’t like about The Beer Store. I don’t think it’s right that Ontario’s main retail outlet for beer is owned by three foreign-owned/partnered companies (Labatt/InBev, Molson-Coors and Sleeman/Sapporo). I dislike the restrictive listing fees that make it difficult or impossible for many small breweries to get their products stocked. And most of all, I despise the fast food style counter service offered at the majority of its locations, a sales method that presents customers with a wall of labels and prices with no other information about the beers on offer, ultimately discouraging many of them from trying new things and enforcing the status quo of The Big 10. While I don’t see my first two complaints being addressed any time soon, the third has been mitigated somewhat by a few self-serve locations, such as the one I visit occasionally at Dufferin Mall. But while it doesn’t bother me much that the main browsing area at this store is essentially a refrigerated storeroom, there are others who are looking for something a bit more refined in their retail experiences – not to mention more variety in singles and six-packs than what’s offered at the average Beer Store, where the 2-4 tends to be king. It’s undoubtedly these types of customers that inspired the creation of The Beer Boutique, a new offshoot of The Beer Store that opens its first location in Toronto’s Liberty Village today. Last night was a media and VIP preview, and I got in to take a few snaps and check out the joint. In terms of the look and feel of the place, it hits all of the current design trends right on the nose, from the exposed brick and piping to the large rustic wooden table that occupies the centre of the room. Refrigerated shelving fills most of the wall space, while non-refrigerated stock sits throughout the rest of the store. 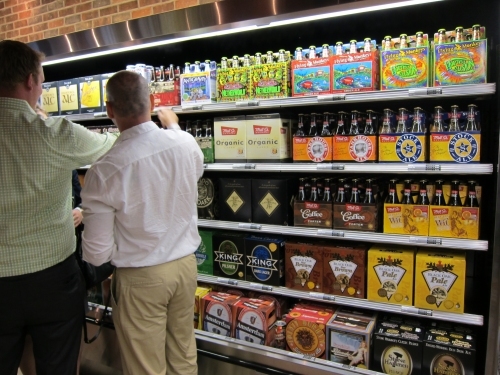 This latter display format breaks from tradition for the Beer Store, where the marketing often brags about the fact that all of their beer is cold, but it’s similar to the LCBO, where much of the beer sits on unchilled shelves. As for the stock itself – well, there aren’t too many surprises. 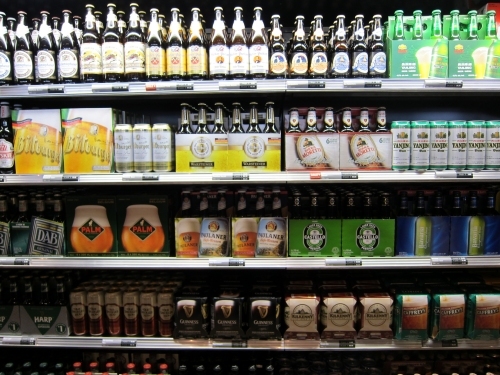 The store features around 200 of the 350ish brands in the chain’s supply system, and the most prominent shelf spots are taken up with the usual suspects like Coors Light, Corona and Canadian. 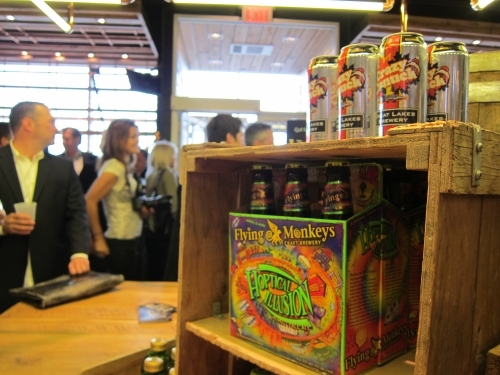 But there are better beers scattered here and there in the store, including a full refrigerated section dedicated almost exclusively to craft and small breweries such as Flying Monkeys, Cameron’s, Mill Street, Great Lakes and Muskoka. I was especially pleased to see the great new beers from the latter two (Crazy Canuck Pale Ale and Mad Tom IPA respectively) on the shelves, and also being poured at the bars set up for the event alongside some less notable brands that I’ve already forgotten. Back when the Beer Boutique was first announced, there were many references to the idea of a Beer Store with a nicer atmosphere as being little more than putting lipstick on a pig. Having now seen it, I can’t say that I completely disagree with this assessment. It’s certainly an attractive and inviting store, and one that I’m likely to pop into when I’m in the area. 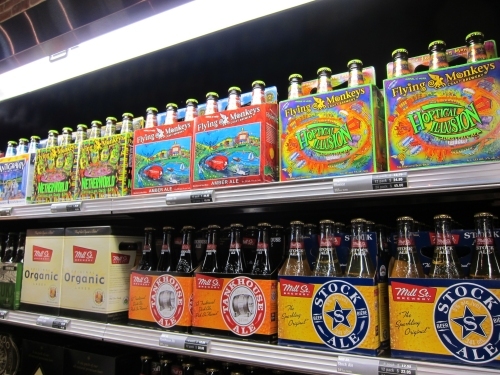 But in terms of what they’re selling, it’s really not much different from a typical Beer Store – i.e. lots of mass-produced pale lager with a small (albeit slowly growing) selection of craft beers and worthwhile imports. We can only hope that having those better beers in front of the customers’ faces rather than stashed in a storeroom will cause more of those customers to take a shot on something new. I doubt it’ll knock Coors Light off the top of the Big 10, but at least it’s a start. This entry was posted in beer shopping and tagged Ontario. Bookmark the permalink. It’s in my ‘hood and I haven’ t had a chance to check it out yet. Rumour has it that this is just another Beer Store with the same old Molson/Labatt swill where you can’t take back empties. Nothing special. Not really a “rumour”, Murphy – my post (as well as several other posts and articles written elsewhere by others) states pretty much exactly what your comment says. I just forgot to mention the bit about them not accepting bottle returns.